Seems like every day there is a new book, new video, or new blog post on what the perfect church should look like. So much emphasis has been placed on outreach and social justice it is easy for us to lose focus on Jesus himself. 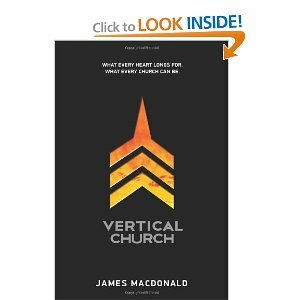 James MacDonald’s book, Vertical Church: What Every Heart Longs for, What Every Church Can Be, does an outstanding job on calling the church back to looking upward, looking vertical to God. Several months ago I came to the realization that I had made ministry my idol. I was caught up in chasing the doing of ministry and I lost sight of the why of ministry. Our real purpose is to worship God. Vertical Church reminds us that this is why we were created. The majority of our energy each day needs to be invested in worshiping Him and bringing Him glory. Out of that life we will naturally bear fruit of ministry to others. We get in trouble when we reverse the order. Vertical Church also calls us to create a church that teaches us to live a life of boldness not one that only talks about how the church will benefit the believer. MacDonald goes into detail on how to keep a vertical outlook in the areas of worship, preaching, prayer and our witness. I do have an issue with a couple of the chapters. The author takes time to give broad generalizations about the problems of the modern church. He seems to believe that he is to call out the sins of the church. However, I believe that we are called to put God first, but how we live out ministry in our church is different. Just like each of us have a different calling so does each church. I felt he would have done better focusing more on the positive aspects of his teaching. Over all the concept of Vertical Church is a powerful word for the Church today. As I work with church leaders Vertical Church will be added to the required reading list. Have you read Vertical Church? What other book about the “how” of church would you suggest and why?